I must say - my body was not all that ready however I was told that I looked pretty alert and in good form even at the last pull at 530 -600 pm today...lip service???? Ill take the props. I learned a bit in the past 24 hours that I can add to the memory bank for extended riding - no...I am not some self proclaimed expert just saying I noticed some things. One....hydration and not to over-do it or suffer the consequences of bathroom runs all the time - a good balance was struck. Two....overcoming lack of sleep - even within a short period of time like 24 hrs. Three...a good saddle is worth it's weight in gold at least a hundred times over. Four....the right foods that are easy to digest. I didn't fail in these but rather noticed the effects of being on track and slipping behind. The best trait of all was the value of support from friends and new-friends even at 4 am (Cindy, Greg and Tim). Thank you for the early hour smiles. Joe and I did about equal amounts of riding and I was on a variety of bikes/spin machines including the Shimano prototype Electronic-DA Orca - super cool. It came out to about 15 hours of riding blended into a 24 hour span of time with no more than 2 hours of actual sleep...the rest of the off-time was more or less awake but not on a bike seat. Once Saturday a.m. rolled around we did break to get some quality brekfast down at Houdy's and helped Larry/Pam get the shop set up for the open house and then back on the bike to finish off the ride. I was glad to be done and realized that this is only a taste of RAAM...and not even a really good representation of RAAM. I had a chance to talk with some vetren epic riders to gleen some advice (Handyman Jeff and Steven Hughes)...thank you guys as your advice on tips/tricks will be taken seriously. Thanks all for coming out tonight to support TSH2009 4-person team for its mission to fundraiser for Camp Odayin in 2009 RAAM. If you did not get a chance to come out tonight, please stop by Trailhead Cycling and Fitness shop this Sat. (Bike Expo) and meet the TSH members. Andy, Joe, Steve, and Brett, we'll be with you all the way!!! Best wishes to all riders and supporters in this coming season. You can follow the TSH news on www.teamstrongheart.org. TSH09 Raffle Tickets are in and for SALE! There is going to be much more than these three...and many variety as well. I will have some of these at Trailhead Cycle in Champlin. Yes, I check the RAAM site each day...and the count-down is ... well...the number is decreasing and my anxiety is increasing in a good way. The wheels are in motion and we are picking up steam. Training is ongoing and constant - more than I have done this early in the year for sure. It feels good to be getting lean in Jan but I am really not liking the healthy diet. I get to a point where I think of food as fuel - and then it all tastes like chicken...or tree bark as Kashi is a staple in our home. Couple of things to remember this next week. 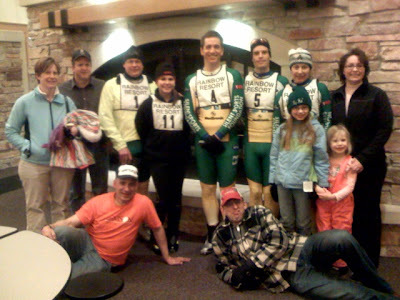 Feb 25th at Elm Creek is a ski event and meet some riders of past and present Team Strong Heart. We 'should' have our 2009 Raffle Tickets by then so bring some cash to purchase tickets.... $5 / ticket. Lots of great prizes that will be drawn after RAAM in June. Trailhead Cycle/Fitness is hosting an open house on Sat the 28th and TSH09 will be hosting a RAAM simulation starting at 6 pm Friday t0 6pm Sat - yes, 24hrs of spin. I will be doing the intervals of 30 mins on - 30 mins off and some intermittent rest. The idea...get a feel for the mental game we will all be going through. Again - some information will be there to help donate to TSH/SSF to help Camp Odayin. Heck, hop on a bike and spin with TSH09 for a few bucks (cheap promotion) and know that your dollars will go to support a worthy cause. We should have a list of items that will be raffled away - the big prizes will be listed on the ticket. Hope to see you there....expect to see you there. HEEEEEERE we come RAAM 2009! IT IS OFFICIAL! Team Strong Heart is proud to announce that we are now on the registration for RAAM 2009 4-person team competition. We are going to be starting our journey....well....a while ago but the race starts June 20th where we will be biking for Camp Odayin to reach our goal in Annapolis MD some 3000 miles down the road and more importantly to raise major funding for Camp Odayin. So the time is now. Our goal is in sight. We ask you - community, friends, co-workers, family and loved ones to get behind TSH and support us as we embark on something wonderful - making dreams come true for children in 2009. "Racing miles to create strong smiles"
I want to formally thank Andrea Riberich at HPI Marketing for pouring her long hours into making TSH visible and for being a great friend of TSH. Please keep a weather eye for upcoming events - soon - related to raising funds for TSH and Camp Odayin. I have spent some quality time out of doors biking the past few days...there is a big difference between indoor training and outdoor training. I know - some say each one is better and the debate continues...I personally think it boils down to the mental state of the rider. See, I am prone to get off the trainer indoors...because I can. Outside...20 miles from home...its cold...windy or there are hills...I have to get through it to get home. Outside puts me in a place where my options are limited to - well - biking. So my time on the trainer this winter is a good lesson in dealing with my nerves. And with that I say bring on the open road - Ill take a tall order of wind in the face - and an extra serving of hill repeat please....and a patch of black ice to keep your wits about you. Ok - not sure how many actually read through here but there has been some remarkable traffic on the front of funds raised for Camp Odayin. We should have our new website running soon - thank you Amy and Bernie - and we are in some huge needs for the following things as we prepare for RAAM. Crew Members - by loose definition ( a remarkable, eclectic and somewhat crazy "passionate" group of people that ride across America with us in cars at about 20 mph giving support to Team Strong Heart...the Heart and soul of the team by far. Overcoming logistics, personalities, time management etc...but most of all a group that has what it takes to make this effort for Camp Odayin come together ). want an adventurous summer vacation? Join Team Strong Heart Crew and experience a life of change. Sponsorship - this is simple. We need assistance in fundraising. Even if you are not on board as a rider, crew, SSF member etc... you can help us. Spread the word and do some research on Camp Odayin and see the real fire that fuels our efforts. This is not for our glory - it is all for the kids. Despite the climate of change and economic windfalls it seems, I have found many still willing and able to give for various reasons. All it takes is knowing our reasons, and then providing proper information and finally giving them the opportunity to help. Utilize the website via paypal, send in orders/donations via snail-mail or come to spin class on Tues/Thursday at Trailhead and see me directly. Feb 7th, 2009 I will be attending the Primary Fundraising Event for Camp Odayin downtown with a few others from TSH / SSF. ALSO keep in mind that there will be a meet/greet for TSH at the Elm Creek Ski Chalet (not sure of the real name) at 630 PM. Me, Steve and Joe should be there with SSF. AND....don't miss the get together at Trailhead Cycle / Fitness on Feb 28th where you can see local vendors, teams, TSH09 and take advantage of great deals - and I'm sure food. More long winded stories - Ill keep it short for now.... SEE YOU ON THE ROAD.